Happy Anniversary to the Family and Medical Leave Act! Since it’s inception in 1993, FMLA has been used over 200 million times! That’s a huge impact on American’s families — for whom using the law meant their job was protected so they could care for themselves or their loved ones. While FMLA provides job protection for certain types of leave, it doesn’t cover everyone and it doesn’t provide any paid leave. It was meant as a first step toward a more compassionate and economically feasible approach to family and medical leave in this country. 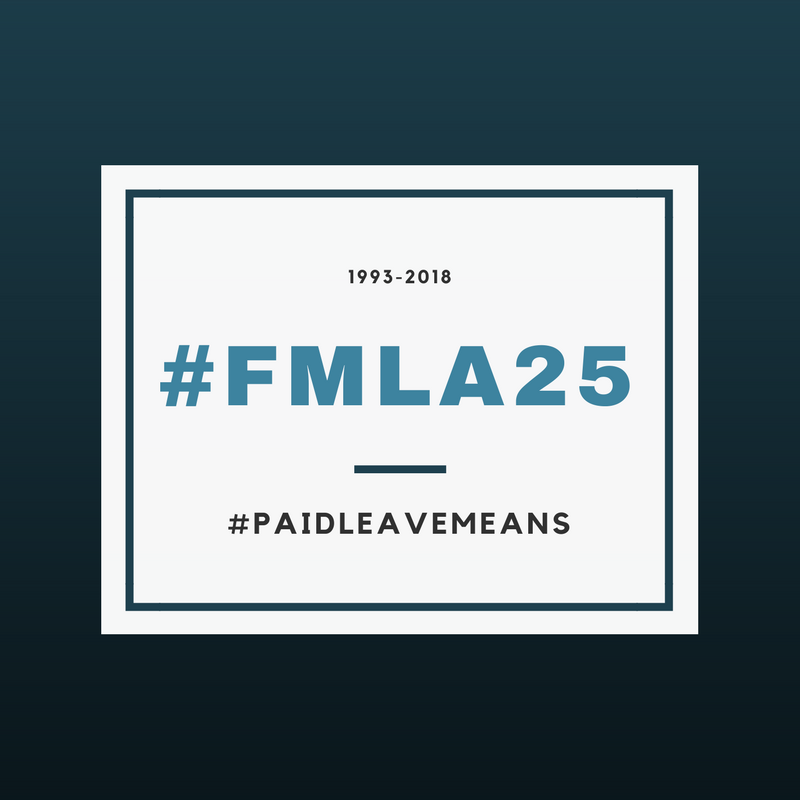 Twenty-five years later, families, advocates, academics and businesses are weighing in on what FMLA means to them and what the next steps toward a better leave culture in America should look like. Ellen Bravo writes for the BetterLifeLab at Slate on how America’s evolving family policies are having real impacts on people’s lives. The Arc has shared a new blog post, “How the Family and Medical Leave Act Saved My Family,” by a mom, Debbi Harris, who talks about how the FMLA made all the difference in the world for her son Josh and their family – and why paid leave is a must-have next step. Incredibly sad news that paid leave champion Kesha Scrivner has passed away. Kesha’s story was featured in the film Zero Weeks. An artlcle in cnn.com that includes a powerful story from GA 9to5 director and Family Values @ Work board member Erica Clemmons. This great piece at CNN.com gives a history of what activists were originally trying to achieve as well as personal stories from women impacted by the current law. A commentary from Julie Kashen for The Century Foundation about how New York’s new law is the strongest one enacted yet. Family and Medical Leave Act at 25: What’s Next? Debra Fitzpatrick connected with Jackie James, co-director of the Center on Aging & Work at Boston College, and Jennifer Greenfield, assistant professor at the University of Denver/ Graduate School of Social Work, to discuss the law and proposed policy innovations. They recently co-authored an OpEd and spearheaded an effort to engage 113 researchers on aging, work and family issues to advance specific policy solutions. A Shondaland blog post by Debra Ness and Vicki Shabo talking about why #paidleavemeans…everything. Pregnant Senator Tammy Duckworth says it’s past time to get real on paid leave. Former Oregon Senate Majority Leader Diane Rosenbaum says it’s time for Oregon to adopt a statewide paid leave policy similar to other states including California and New York. An updated chart from The National Partnership for Women and Families highlights new and expanded paid leave policies for more than 100 businesses. This piece digs into the research to outline what must be included in a federal paid leave policy that benefits workers and their families while improving broad-based economic growth. A post from IWPR’s Heidi Hartmann and Jeff Hayes that looks at the body of research on paid family and medical leave. The Institute for Women’s Policy Research’s fact sheet with updated estimates showing that the FAMILY Act provides vital benefits at an affordable cost of less than half of one percent of payroll. Resources to understand how New York’s new paid leave law impacts employees and employers. Tell Congress to pass the FAMILY Act. Use this toolkit from the Zero to Three advocacy group which includes talking points, a fact sheet and a sample op-ed. Use the tools from the Zero Weeks website to call and write your Congressional Representative. Have something to add to this list? Please email us.